Well last week, we saw two new PVP games come out that might be worth your time. If you enjoy Clash Royale and want to try a similar game, then you should take a look at Gameloft’s Blitz Brigade: Rival Tactics. This is a free to play game with IAPs and some ads. Now the ads are not bad; you can watch extra ads to earn gems too. Just like Clash Royale, you will fight against other players online with a 8 man squad you create. As you earn victories and upgrade your troops, you will progress to new arenas to fight in. You can join factions and send and receive gifts. The graphics and gameplay are good. Since it is new, there are not as many players online, so you might have to wait to find an opponent. To do well in the game, you need to setup a good deck and know how each troop plays. I have found modest success so far but I need to learn the troops better. The second game is from Rovio, Battle Bay. This is a new 5 on 5 multiplayer game. In the game you choose a ship (the Enforcer, the Defender, the Shooter, and the Speeder) and then battle. As you progress in the game, you will be able to upgrade your character’s skills and weapons cannons, torpedoes, and grenades. You play the game using two hands and then steer and shoot with on screen thumb controllers. The game appears to be a lot of fun and the graphics are great. In addition to playing with friends, you can join a Guild too. 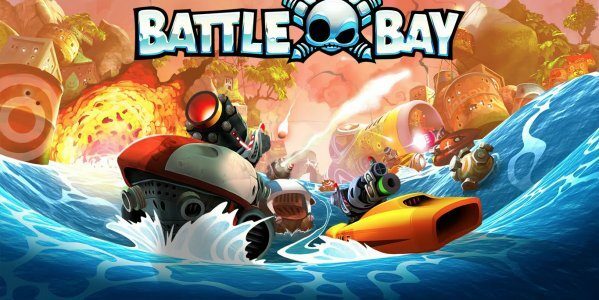 If you enjoy MOBA, then Battle Bay looks to be one to try.